"Prepare to swing and be moved!" 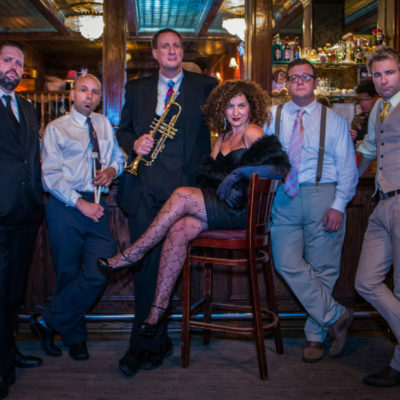 (JazzLives) as Svetlana and the Delancey Five transport you to the carnival of sound, seamlessly moving from sophisticated tender tones to a rowdy "exuberant, foot-stomping music combining swing and pop-singer/songwriter sensibilities" (WPIX11TV) fit for the 21st Century! Fronted by the "energetic" (Will Friedwald, Wall Street Journal) Svetlana Shmulyan, the band has headlined many sold-out shows in the US, from the premier venues such as the Blue Note, Iridium, Joe's Pub, to the packed and sweaty underground New York speakeasies, and the band's Times Square Swing Flashmobs where "the crowd of revelers" (Time Out NY) gyrate together to the band’s jubilant playing! The band has also toured internationally, appeared on various national and international TV programs (US Travel Channel, UK's Virgin Atlantic TV, Israel's iTV, Russian's My Planet, German's Channel 1, Japanese Travel TV, Brazilian Chicas of NY, and more) and has been featured in numerous international news and music and lifestyle publications (Huffington Post, All About Jazz, Wall Street Journal, PopWrapper, Broadway World, and more). Band's record Night at the Speakeasy (produced by Guy Eckstine and featuring Wycliffe Gordon) has premiered among the "most added" on JazzWeek and CMJ Jazz Radio charts, received a 4-star rating from AllAboutJazz, and gathered accolades as "The Best of 2016" on Classicalite Music news site.